The Nexus Bar Stool Black is a smart and chic piece of furniture ideal for a modern bar area or kitchen. Enhancing your interior whilst maintaining its space-saving appeal, the Nexus makes a perfectly practical yet stylish choice for many locations. Smartly upholstered in black faux leather, the seat has thick padding and a low backrest for comfort and reassurance. Horizontal stitching enhances the contemporary character and adorns both the seat and backrest. Beneath, the metal frame has a polished chrome finish with various practical features. A hydraulic gas lift sits within the column and provides adjustable height with 360-swivel, while a half-moon footrest is stylish and supportive. The circular base keeps the stool sturdy and incorporates a protective rim underneath to take care of your kitchen floors. "Comfort and style at an affordable price"
Amazing value, quick delivery and excellent quality! Would recommend. Fab quality and amazing service. Best purchase ever. 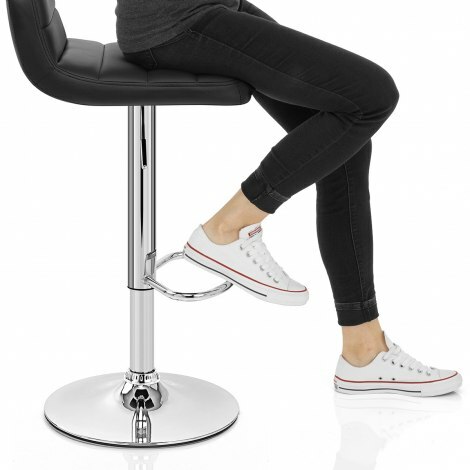 This bar stool is extremely comfortable with the low back giving good support. And also low enough to fit under my breakfast bar, and looking very stylish. Easy to assemble. Very impressed with the service. Next day delivery with a text an hour before. I am very happy with the end result. We were pretty limited with the width of stools we could get and these ended up being perfect - a good size but not bulky. They are very comfortable and the gas lift is great especially when you have children who need the stools lower. Overall the look of these stools is very elegant and modern but I believe they could work with many styles of decor. I, like others, am a returning customer. I bought 4 Nexus bar stools to replace my previous ones after 6 years of constant use. They arrived promptly are very good quality for the price, very comfortable and look great. Excellent company would thoroughly recommend.